ATAC Announces Results from its Con… | ATAC Resources Ltd.
August 28, 2018 - Vancouver, BC - ATAC Resources Ltd. (TSX-V:ATC) (“ATAC”) is pleased to announce exploration results and the acquisition of the TN claims adjacent to its wholly owned Connaught property, located at the head of the Sixty Mile Placer Gold Camp in west-central Yukon. The Connaught property hosts an extensive system of silver-lead-gold veins. It lies about 65 km due west of Dawson City, Yukon, and is accessed via the Sixty Mile Road off the Top of the World Highway. With the acquisition of the TN claims, the Connaught property is now 115.5 km2. The expanded property is available for option as ATAC continues to focus on its Rackla Gold Property in north-central Yukon. Exploration programs in 2015 and 2017 were carried out to fulfill assessment requirements and keep the Connaught property in good standing. ATAC collected a total of 272 soil samples and results were highly encouraging. 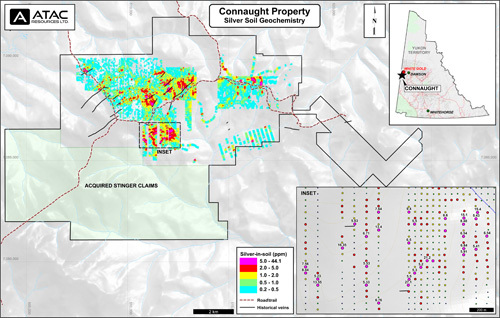 The 2017 sampling identified the largest, and strongest, coincident silver and lead soil geochemical anomaly on the property to date, in an area with no known mineralization. The 2017 anomaly is 1,500 m long by 600 m wide and comprises very strongly anomalous lead and silver-in-soil values ranging from 5 to 15.4 ppm silver and 500 to 2,000 ppm lead, respectively. The Connaught property lies within a complex, northeast-trending fault system called the Sixty Mile-Pika fault system. This system is thought to have focused Late Cretaceous high grade epithermal, porphyry and skarn style mineralization at many locations along its 150 km length. To date, 20 major vein structures have been identified on the Connaught property. Where exposed, the veins are typically 0.3 to 2 m wide and grade between 100 and 3,150 g/t silver, 3 to 64% lead and background to 10.90 g/t gold. Under the terms of the property purchase agreement with Independence Gold Corp. (“IGO”), ATAC will acquire a 100% interest in the TN 1 through 210 claims. The purchase price will consist of 60,000 ATAC shares. IGO will also retain a 1% net smelter return royalty interest in the TN claims. The transaction remains subject to TSX Venture Exchange acceptance. Analytical work for all projects was done by ALS Minerals, with sample preparation in Whitehorse, Yukon and geochemical analyses in North Vancouver, British Columbia. All soil samples were analyzed for gold using fire assay fusion and inductively coupled plasma – atomic emission spectrometry (Au-ICP21) and 51 other elements by four acid digestion and inductively coupled plasma-atomic emission spectroscopy (ME-MS41). The technical information in this news release has been approved by Heather Burrell, P.Geo., a senior geologist with Archer, Cathro & Associates (1981) Limited and a qualified person for the purposes of National Instrument 43-101. ATAC is a Yukon-based exploration company focused on developing Canada’s only Carlin-type gold district at the Rackla Gold Property. Work on the ~1,700 km2 property has resulted in an Osiris Project Inferred Mineral Resource of 1,685,000 oz of gold at an average grade of 4.23 g/t (in 12.4 Mt) and a positive Preliminary Economic Assessment for the Tiger Gold Deposit within the Rau Project. ATAC and Barrick have partnered to explore the Rackla Gold Property’s Orion Project, with Barrick having the option to earn up to 70% of Orion by spending $55 million in exploration. ATAC is well-financed with approximately $15 million in its treasury and is currently completing a $7 million exploration program at the Osiris and Rau Projects (which are not subject to Barrick’s earn-in right), while concurrently working with Barrick to advance the Orion Project.